As I said, that's quite a long list of new features and additions. Let's break some of this down, starting with multi-accounts. Telegram X will now let you sign into as many accounts as you want, and the app will support different themes for each one to keep them from getting mixed up (as if there was anything worth using but the dark theme /s). Pressing and holding on an account shows a preview of the chat list, and the order can be rearranged to put your main account(s) up top. You can switch between however many you have seamlessly for new messages. 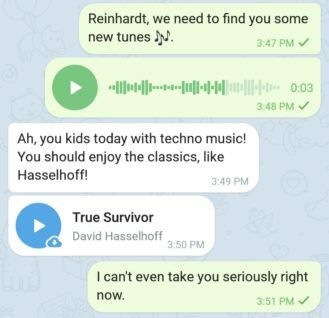 Telegram X is getting more themes and chat appearance options. In addition to the classic and dark themes, you can choose from red, pink, cyan, green, and orange. Bubbles can also be disabled for channels (but left on for chats) and images in channels with the bubbles disabled will be full-width. Users will be able to share their live locations with each other, after which either you or the other person can see an in-app map view. You can then tap a point on the map to check it out, then restore back to the default overview. Night theme is supported, with an automatic mode switch. Sharing the live location will also display the real-time distance between you and the other person. Finally, similar to Hangouts way back when, asking a person where they are will give them the option to share their live location with a little map in the chat. Chat actions, like when the other person is typing or sending a photo, will be animated in the list overview. This is now universal across said overview, in the chats themselves, and in the previews. And for anything running Lollipop and above, images and stickers will appear in the notifications, so no more "So-and-so sent a sticker." If the image takes too long to load, Telegram X won't include it in the notification (it uses the auto-download setting, which you can tweak yourself). If it's important to you, emoji skin tones can now be adjusted. You can change it for a single use (that current message) or for all emojis going forward. Simply hold on the one you want to send, select the tone, and optionally swipe up to apply it to all the others. Telegram X is also improving sticker suggestions, offering you more choices when you tap an emoji — it can even show you some choices from sticker packs that you don't have installed. This setting can, of course, be changed to your liking. Chats are getting some streamlined features. Pinned items can now be reordered by simply holding and dragging them to the position you want. Phone numbers are now highlighted, Telegram X is adding an option to report a message, tapping the header opens the other person's profile, hold or tap the group picture to preview it without going to the profile, and images/gifs can be previewed inline before sending. Telegram X is also adding support for an unread counter next to its homescreen icon. If you're using the bubble chat design, you now have the option for swipe to reply (this means that swipe-to-share is disabled by default, but it can be re-enabled in settings). The final items in the changelog are pretty self-explanatory, so I won't insult your intelligence by reiterating. So, that was a huge thing to get through. By now, most everyone should have the update, but in case you don't, you can scoot on over to APK Mirror to download the file. And if you haven't tried out Telegram X for yourself, I recommend it — I only use the main app on my OnePlus 5T because X doesn't display notifications on that phone (works fine on every other one). Oh, well, I'm living the double life, I guess.